Hog Roast Auchinleck is often asked to cater all kinds of private parties, including birthdays, engagements, christenings, retirements and anniversaries, as well as weddings of course. But we also cater corporate functions, both locally and nationally, for companies large and small, and in all types of venues. When you’re organising a business event, you shouldn’t have to worry about the food, as it can add to the stress of the day. 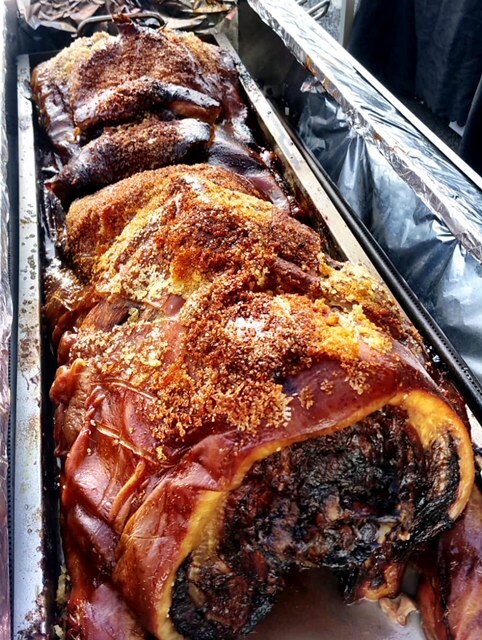 With Hog Roast Auchinleck, you’re in great hands, as we plan the menu in advance together with you, turn up on time and work hard to impress you and your guests with service second to none, and then at the end of the day, we even do the washing up too! For a corporate event that we catered on Friday, Dave asked us to provide our succulent pigs in buns for around 100 people, as well as a vegetarian option for several guests. Our pigs in buns are famous all over, and we have repeat customers who can’t get enough of our tender, moist meat and crispy, salty crackling. Put them together with our tangy apple sauce and tasty sage and onion stuffing inside fresh bread rolls or wraps, and they are slices of heaven just waiting to be devoured. In terms of vegetarian choices, we have plenty, as we’ve spent years ensuring that all of our customers and their guests are able to eat our food. One of our most popular vegetarian options is our grilled veggie skewers, full of halloumi, mushrooms, tomatoes, mixed peppers, red onion and courgette, which is what Dave asked us to make for this event too. On the day of the function, our Hog Roast Auchinleck chef and assistants arrived at the business premises venue late morning, ready to set up our equipment. We’d been asked to serve the food around 4pm, and since it takes a good few hours to roast a hog, we had to get there early. Later that afternoon, while the hog was resting and waiting to be carved, we grilled the skewers, arranged the fixings for the pigs in buns and then the hordes of people began to queue up for a bite to eat.